Educating students about external funding sources and alternative financing approaches. Open House for Graduate MS programs where prospective students network with current graduate students, faculty and alumni and learn about financing, housing, campus climate, and living in central Massachusetts. Information sessions via Skype, WebEx or phone are also available for those unable to attend in person. Campus-wide, Annual Open House welcomes hundreds of visitors, including prospective students for DVM and graduate programs. The admissions office staffs an information booth and conducts presentations and Q&A sessions. 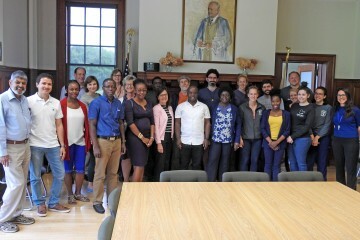 Cummings Hosts International – a campus-run program focused on creating a welcoming environment for international visitors and committed to hosting events that celebrate diverse cultural traditions. Cummings School’s participation in the Veterinary Medical College Application Service (VMCAS) increases reach nationally and internationally for prospective veterinary students and creates an efficient application process consistent national best practices. The long-running USAID-funded One Health/Global Health project has increased the number of African-American faculty and staff and two of the three MS programs employ African-American program managers.